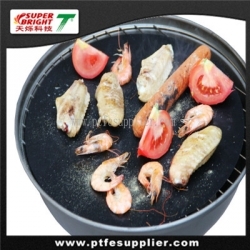 your BBQ hotplate and you place your meats on top of it. hot soapy water when you're done! The PTFE Baking Sheet will last for years with the correct care, and your BBQ will stay clean and shiny for even longer. You can even use them in the oven and in frying pans! With summer coming up, there's on better time to get your hands on some of these! Cut the oven liner to size and place the liner on the lowest shelf in your oven. Do not put the liner directly on the oven floor. Let the oven cool down before removing the liner. 1) Avoid using metal, sharp or pointed objects on the liner, they might damage the liner. 2).Do not put the liner in direct contact with flames, burners, grill or heating elements. 3).Never put the liner on the floor of the oven, but always on the bottom rack! 4).Do not cover ventilation holes of the oven (gas oven).